The beauty of our planets, their moons and our sun unfolds in these models of our solar system built to scale. They accurately reflect the true relationship of the sun, planets and moons to each other. Model also includes the asteroid belt, the Kuiper belt, all three officially recognized dwarf planets (Ceres, Eris and Pluto) and a Kuiper/asteroid belt information sheet. A reversible scale/distance chart in English and metric is included for the proper spacing of the planets and moons, because even at these scales the distances are still vast. The planets and major moons are mounted on beautifully crafted pine bases, finished in an equisite starry night effect. Two sizes are available to fit your space. 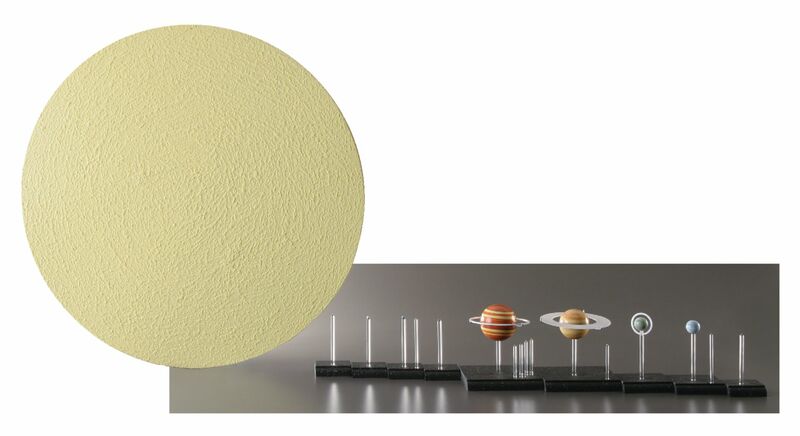 The standard model's sun has a 26.5" diameter, the deluxe model's sun has a 53" diameter.